If you’ve experienced reverse culture shock before, you’ll completely empathise with my guests today. If you haven’t, you might think it’s a sadness experienced by very lucky people who should get over themselves. I promise, having experienced it myself, it’s not that simple. Yes, we’re very privileged to have been able to travel – especially to spend extended time abroad, perhaps – but that doesn’t mean it’s necessarily easy to fit back in when you return home, and something like re-entry shock can happen to anyone. I know I struggled! In this episode of The Thoughtful Travel Podcast I was lucky to speak with three guests who’d all spent different amounts of time abroad and yet all had something in common: they could absolutely relate to the experience of reverse culture shock. 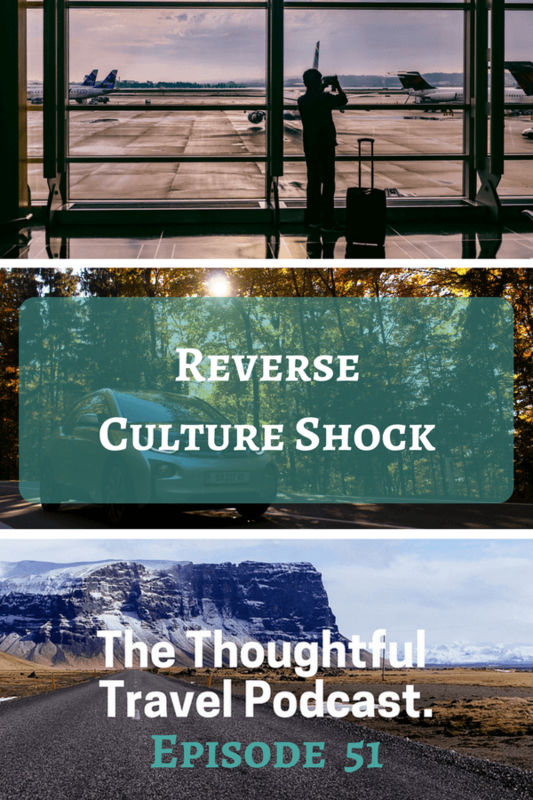 Everyone has experienced culture shock on their travels, but what about reverse culture shock? When I returned back to Australia after six years living in Asia and Europe, reverse culture shock hit me badly, and I’m definitely not alone: Episode 51 of The Thoughtful Travel Podcast includes chats with three other travellers who’ve had the same experience. First up, I chat with Cait Flanders, who suffered from some reverse culture shock after returning to her hometown in Canada after a two-month American road trip. Mike Campbell and his family spent a year housesitting their away around the United States before returning to Australia, and his reverse culture shock is proving life-changing. My final guest is Matt Treglia and his experience of reverse culture shock is scarily similar to mine. Issues like having nobody who wants to hear about his travels and finding it really hard to fit back into everyday life are common to many of us who’ve spent an extended time abroad.